The club finished up for the year with our meeting on 11 December. It was a quiet day at the club with just two games happening, both FOG-N. Kendall (Prussians) and Danny (French) played one game, and in the other Philip (Netherlands) got a 20-5 victory against Brett (Austrians). The Flames of War Masters Tournament was also held on 10/11 December, nearby in Devonport. Ken, Kit, and Robbie were there representing our club. A Steve benevolence day today. He started off by beating Ken's Sperrverbande with his Tankovy in a Surrounded mission and then steered an 1814 Austrian Reserve Corps (with advice from Lord Donald, Lord Ponsonby and Blueski) to a 19-6 win over Brett with 1814 French Guard Corps. A fairly typical meeting for our club, with two Flames of War games and one FOG-Napoleonic game. Andrew (1814 Austrian) beat Brett (1814 French) 16-11. The Austrians were only 0.5 ACV from breaking themselves in a very close fight. We had two games of FOG Napoleonics at the club today. There was a 1600 point multiplayer game with Al and Andrew (British) against Brett and Andrew (French). Neither side was broken after half a dozen pairs of bounds, although the French flank march had arrived and on the other flank a French cavalry unit had almost reached the British line of communications. In the other game, Kendall's Russian cavalry corps got a 23-2 win against Philip's Netherlands army. DBMM 15mm - Philip (New Kingdom Egyptian) played Kendall (Early Samurai with the brilliant Yoshitsune). A 17-6 win to the Egyptians, thanks largely to the benefits of regular baggage! 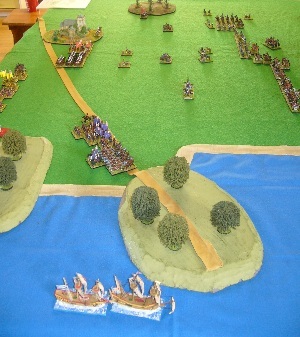 FOG Ancients 15mm - Chris (Sea Peoples) beat Philip (New Kingdom Egyptian) in a game using the starter armies. FOG Napoleonics - Brett's Austrians had a rematch against Al’s 1815 Brits, 1000 points this time. The Austrian Reserve Corps got a much better result, a 19:6 draw to Austria after playing 4 hours. British losses about 45%, Austrian 22%, with fresh cavalry left for bonus points. An extra turn was played after ‘time’ was called in which the Austrians routed an extra allied unit, taking the British over 50% and breaking them. FOW - Three games of FoW: Steve v Ken, Kit v Jason, and Rob v Michael. 29 September 2011. Added a link to Dopey Dog Laser Engraving on our list of local manufacturers. 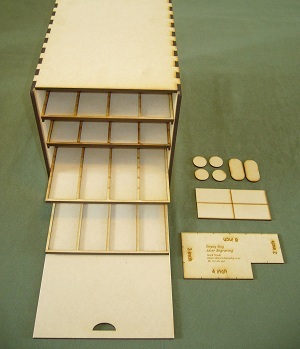 They do laser cut bases, movement trays, measuring sticks, and army storage boxes. The club hall was busier than we have seen for a long time, with the second day of Push of Pike as well as a regular club meeting. As well as four tables with DBR games for PoP, there was another renaissance game using Baroque - the C17 version of Basic Impetus. FOG-N. Al's British continued their impressive winning streak with a victory over Brett's Austrians. FOW. A couple of Flames games, Jason's Germans took on Steve's Soviets, and Rob's Commandos played Ken's Americans. Eight of us playing Push of Pike this weekend. We are using armies of the English Civil War and Thirty Years War. Round 1 on Saturday saw several close draws, and a few complete disasters/comprehensive victories! Richard won the tournament, Philip was second, and Brian got the best painted army prize for his Parliamentarians. Al and Andrew had another FOG Napoleonics game, this time with British versus Neapolitans. The British made a good start to the game, coming close to a 30-10 win, but the Neapolitans won one of the flanks to bring the game back to a draw. In WWII, Ken (US) and Kit (Germans) had a Flames of War game, and then Kit and Steve began Battlefront's Market Garden boardgame assisted by Ken. There were 5 Flames of War games today: Lee v Steve, Lee v Tristan, Steve v Kit, and Rob and Ken played twice. In FOG Napoleonics, Al's British continued their winning streak, with a comprehensive victory over Andrew's Italians. Brett and Philip had a 1000 point game, with a 20-5 win to the British-Netherlands-Brunswick forces against the Austrians. Meanwhile at the painting table, more Russians rolling off the production lines! Flames of War. Ken v Steve. Flames of War. Andrew v Jason. There was an Impetus 15mm Ancients game, the first time Impetus has been played at the club I think. FoG-N. Andrew (Italians) beat Brett (Turks). FoG-N. Al and Philip had a rematch of last meeting's British v French clash. This time the French were Drilled rather than Veteran and did better than the previous battle, but it was still a convincing win to the British. 15mm FOG Napoleonic: Al's 1815 British defeated Philip's French Army of the Orient. The defending British outshot the attacking French, and counter-attacked with their infantry to win an easy 30-10 victory. The impetuous British cavalry kept well out of trouble far to the rear of their infantry. FoW: Kit (SS Panzergrenadier) beat Steve (Strelkovy) 6-1 in the Cauldron. Aggressive counter-attacking and dice-rolling by the Germans routed the Russians before the late-arriving T-34/85s could take an objective. Impressive dice-chuck from Eyleski as Von Goldsbury continues to roll 5s and 6s. 15mm FOG Napoleonics: Andrew's Italians defeated Philip's Netherlands and Brunswick army. FoW: There were six Flames games at the club today: Brett (Finns) v Lee (US); Ken v Lyndon; Lee v Lyndon; Lee (US) v Kit (Germans); Brett (Finns) v Jason (Germans); Steve (Soviets) v Tristan (Germans).